I’m astonished we’re still communicating, but don’t be fooled. Just because you’ve made it this far doesn’t mean you’ve gotten the job. There is one final phase of the interview process. I have a very important premiere tonight and I need you there with me. You must take careful notes on what everyone is wearing because, at the end of the day, what people are wearing is our business. If you want to work for Donovan Decker, you must prove that you have keen powers of observation. And remember, you can’t be everywhere, but I must know everything, so you must ask your readers to help you if you hope to succeed. Then show me that you can become a trusted fashion source for masses of people who have less style than I do. Choose one person you have observed and write a “get the look” entry on your blog. Tell your readers to share their “get the look” tips here and mention the name of your blog. And remember, don’t be late. If you miss the premiere, you miss out on the opportunity of a lifetime. If all of your assignments are not completed by tomorrow, January 4 at 11:59pm PST, you will be out of the running. Puffy skirts, high heels, and belted cardigans. Are those pigeon toes I spy in the third photo? If I didn't know any better, I'd think that Jane had a personal style blog herself... or at least a Chictopia account. 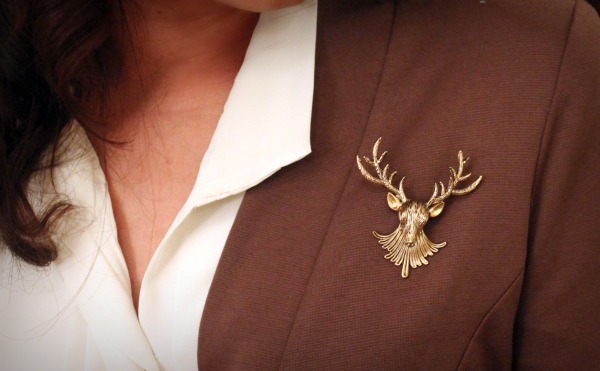 If you watched the premiere, you'll know that animal (and bug) brooches are going to be hot this year. This look was inspired by the one Jane wears to her job interview. 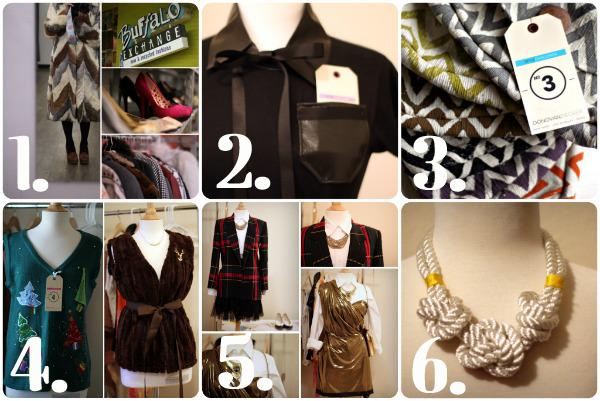 skirt: F21 | blouse: thrifted, Savers | pin: surprise Christmas gift from Accessorize (they know I love animal jewelry!) | blazer: Langford Market | loafers: c/o Francesca's | tights: Target | belt: Hey, Meg, is this your belt? I think I borrowed it from you in college and never gave it back because I wore it all the time. Five years later... I still wear it all the time. Thank you so much for the opportunity to interview with Donovan Decker. Seven interviews! Wow! Surely that's some sort of record for (fictional) job interviews, right? I think by now you have a good idea of who I am and how I work, and you have a well rounded view of my style aesthetic. You say you're looking for a blogger who has a "sparkling personality, impressive creativity, and the ability to influence the masses". I hope I've shown you that I have those traits, but most of all, I hope you can see that I took on all of these challenges and did them to my fullest ability. You helped me create better content for my own blog over the holidays, you've given me an ego boost regarding my own DIY skills, and you gave me a dress form. I hope I don't have to mail that back because I've kind of fallen in love with her and like having her around, plus I imagine that the shipping on that thing is extraordinary. Congrats on a great premiere!